How much have temperatures risen over the past 100 years or so? By how much are they likely to rise in future? The image below, from a 2012 study by Schlesinger et al, illustrates the danger. The authors present a 'Fair Plan' for reducing global greenhouse-gas emissions. Under the Plan, all countries begin mitigation in 2015 and reduce greenhouse-gas emissions to zero in 2065, in the hope that this will keep global-mean warming above preindustrial temperatures below 2°C. Aerosols. As pointed at in the image below, aerosols from fossil fuel and biomass burning are currently suppressing the full impact of global warming, but only for several years ahead, while the impact of carbon dioxide can last for hundreds of years and longer. To maintain such suppression, adding aerosols to the atmosphere would need to continue. Lag time. The worst of global warming is yet to come. It takes time for the full impact of added heat to become manifest as atmospheric temperature rise. As an example, the combined effects of ocean acidification and climate change result in lower dimethylsulphide emissions from oceans. This alone is raising temperatures by 0.23 to 0.48 degrees K.
Accelerated Warming in the Arctic. While warming may appear to be only mild in some areas, it is felt even fiercely in the Arctic. Most heat (well over 90%) goes into the oceans, which hits the Arctic particularly hard as the Gulf Stream pushes a lot of warmer water into the Arctic Ocean. 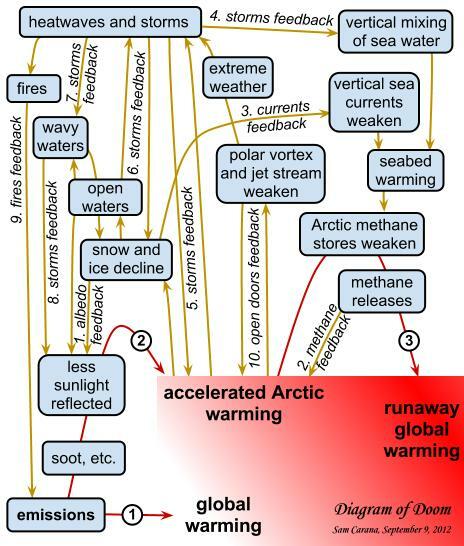 Warming in the Arctic is further accelerating due to additional circumstances and feedbacks that are specific to the Arctic, such as albedo feedbacks (as further discussed below). Continued warming in the Arctic threatens to trigger methane releases large enough to terminate civilization as we know it and to cause widespread and massive death and extinction. In the image below, Peter Carter points at the aerosols from volcanic eruptions and fossil fuel combustion that temporarily delay the full impact of global warming. 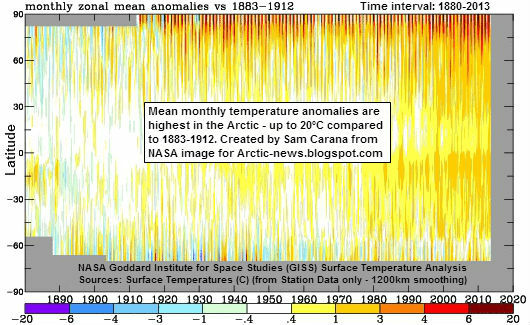 In above image, temperature anomalies are compared to a 3-decade base period from 1951 to 1980. 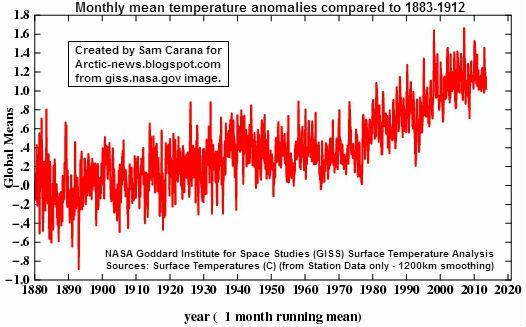 To highlight the full wrath of global warming, it is more informative to compare anomalies with an earlier base period. Furthermore, a short running mean better shows how high peaks can reach. NASA typically compares temperature change relative to 1951-1980, because the U.S. National Weather Service uses a three-decade period to define "normal" or average temperature. The NASA GISS analysis effort began around 1980, so the most recent 30 years at the time was 1951-1980. But as said, it is more informative to use a 30-year base period that starts earlier. To show Gobal & Arctic Temperature Change, James Hansen and Makiko Sato used a 1951-1980 base period next to a 1880-1920 base period. For this post, a 1883-1912 base period was selected to create the above image, and this same base period was selected to create the image below. Above image shows that the Arctic is hit most strongly by the temperature rise. Note that the anomalies in above image are visualized by latitude, but are averaged by longitude globally, masking even higher anomalies that can be experienced at specific longitudes. At times, some areas in the Arctic do already experience anomalies of over 20°C, as shown in the animation below, based on NOAA data for the period December 7, 2011 - January 21, 2012. Above animation was created by Sam Carana for the page Warming in the Arctic, which adds that the anomaly can be even more striking for individual days and locations. On January 6, 2011, the minimum temperature in Coral Harbour, located at the northwest corner of Hudson Bay in the province of Nunavut, Canada, was –3.7°C (25.3°F), i.e. 30°C (54°F) above average. Anomalies for surface air temperatures are higher in the Arctic than anywhere else on Earth. The increase in temperature anomalies appears to be an exponential rise. 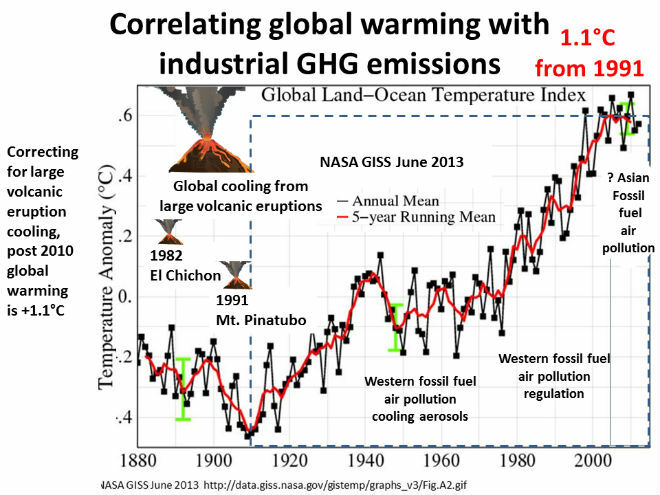 Note that temperature anomalies in the above graph are again compared to the global average for the period 1951-1980. 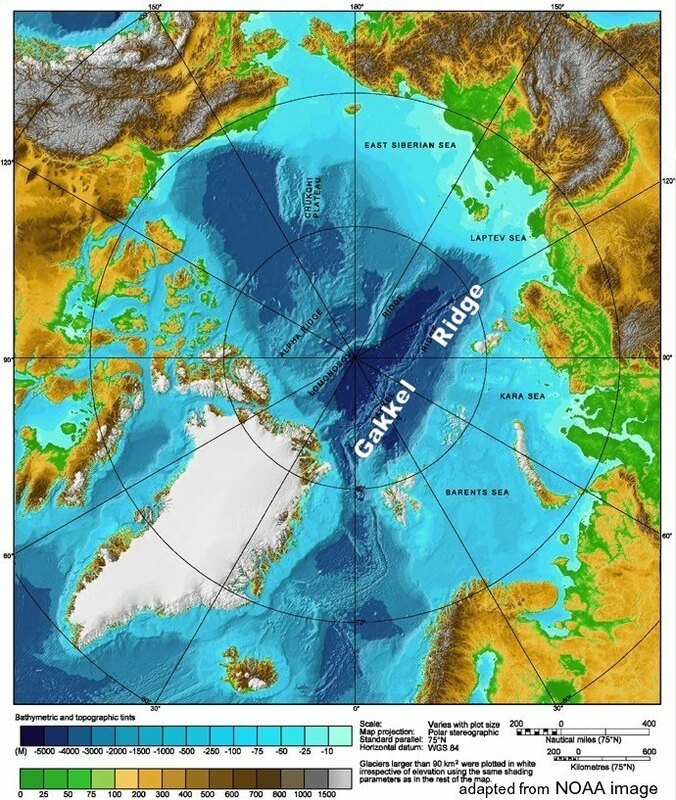 The danger is that extreme weather events will cause waters in the Arctic Ocean to warm up, in turn causing heat to penetrate deep into the seabed and triggering destablization of methane held in the sediment in the form of hydrates or free gas. Ways for this to eventuate were also recently discussed in the post Arctic Ocean is turning red. 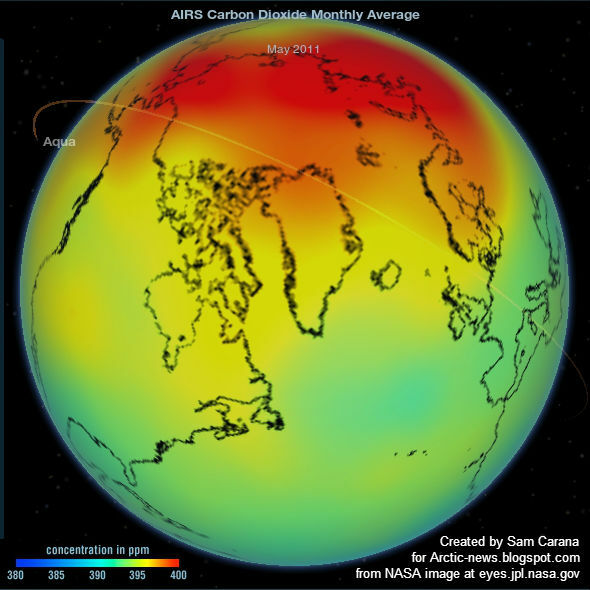 Concentrations of greenhouse gases can be much higher in the atmosphere over the Arctic than elsewhere, especially in months when it counts most, as illustrated by the May 2011 carbon dioxide concentrations in the image below. Also, the Arctic receives high levels of insolation during the northern summer. The amount of solar radiation received by the Arctic at the June Solstice is higher than anywhere else on Earth, as illustrated by image 15. below. 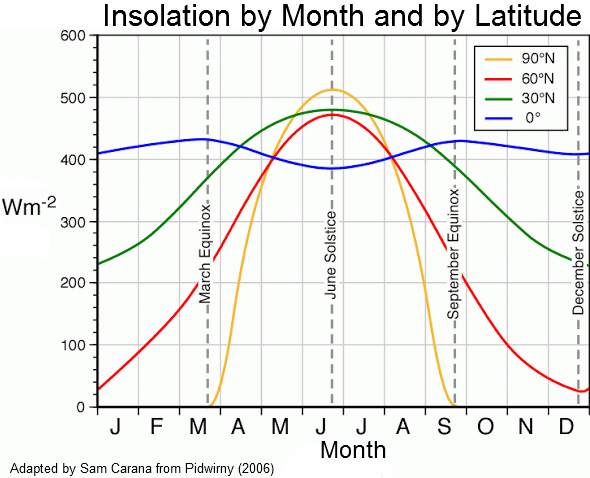 Similarly, solar radiation in Antarctica at the December solstice is the highest on Earth. Further circumstances that are particular for the Arctic are also described at Methane Hydrates. In addition to these circumstances, there are feedbacks that further accelerate warming in the Artic, as described below. Such feedbacks have the potential to dramatically speed up the temperature rise. 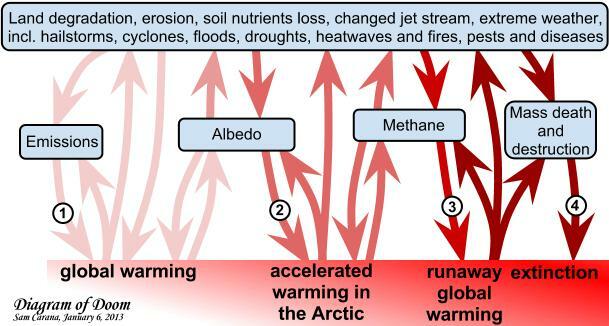 Albedo change is caused by decline of snow and ice in the Arctic, and by changes in vegetation in the Arctic. Albedo change exercizes a strong additional warming feedback. As illustrated by the above image by Neven, from the Arctic Sea Ice blog, average Arctic sea ice thickness (crudely calculated by dividing PIOMAS (PI) volume numbers with Cryosphere Today (CT) sea ice area numbers) is the lowest on record in the satellite era. Another feedback is methane release. Methane emissions originate from many sources, including wetlands, burning of fossil fuel and wildfires. 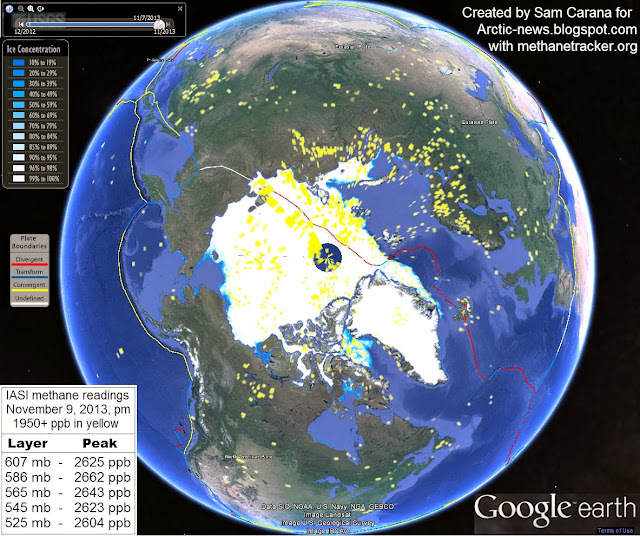 On November 9, 2013, p.m., methane readings were recorded by IASI* as high as 2662 parts per billion (ppb), at 586 millibars (mb) pressure, which corresponds with an altitude of 14384.6 feet or 4384.4 meters. 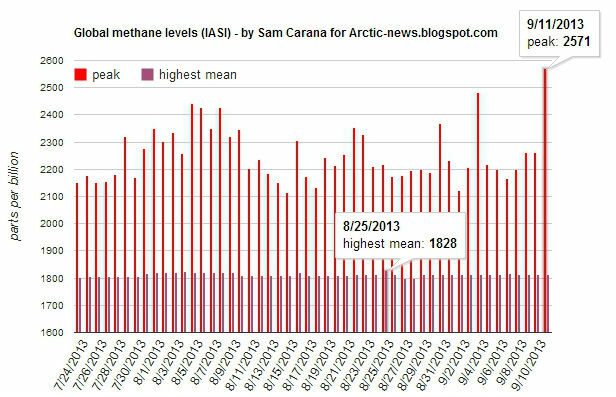 The image below shows peak levels recorded from late July to early September 2013, as well as the highest mean methane level for each day. One of the most threatening feedbacks is release of methane currently held in sediments under the seabed. These sediments can get destabilized by earthquakes and by warming of the seabed, resulting in release of methane in what can be rather abrupt ways. 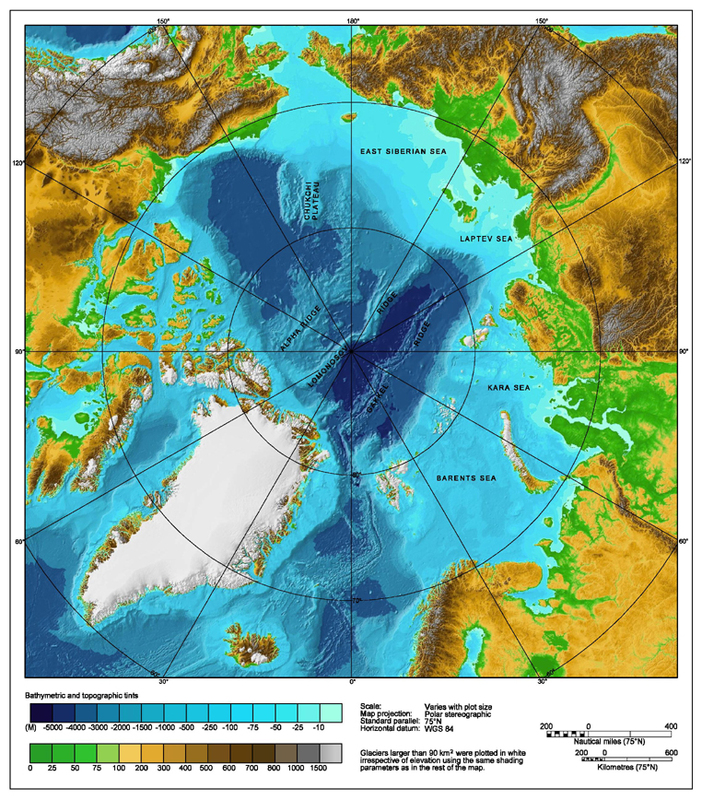 The danger is that, as sea ice retreats further and as methane traps more heat, there will be areas in the Arctic Ocean where cyclones will cause shallow waters to warm up all the way down to the seabed to such an extent that heat will penetrate the seabed, triggering destablization of methane held in the sediment in the form of hydrates and/or free gas. Sea surface temperatures of about 20°C (68°F) have been recorded in some spots in the Arctic Ocean, as described the post Arctic Ocean is turning red. 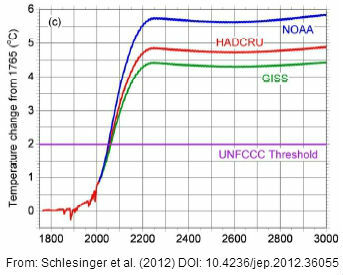 The image below is part of a paper on the unfolding "Methane Catastrophe". Back in 2008, Shakhova et al., in the study Anomalies of methane in the atmosphere over the East Siberian shelf: Is there any sign of methane leakage from shallow shelf hydrates? considered release of up to 50 Gt of predicted amount of hydrate storage as highly possible for abrupt release at any time. As the Arctic warms up and the sea ice retreats, more cyclones can be expected to hit the Arctic Ocean. This can cause warm surface waters to be mixed down, in many places all the way down to the seabed, due to the shallow nature of many of the seas in the Arctic Ocean. 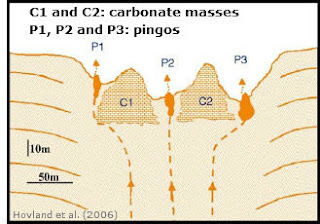 As shown on the image right and also described at the FAQ page, there can be all kinds of fractures in the sediment, while there can also be conduits where methane has escaped earlier from hydrates, allowing heat to penetrate deep into the sediment and causing methane to escape. Methane is kept stable inside hydrates as long as the temperature remains low. Since methane expand some 160 times in volume, compared to its compressed frozen state inside the hydrate, warming of even a small part of a hydrate can cause destabilization across the entire hydrate. It may take only a small rise in temperature of a single conduit in the sediment to set off a large abrupt release of methane, which subsequently threatens to cause further releases elsewhere in the Arctic Ocean and trigger runaway global warming, as described at the methane hydrates blog. Due to methane's high global warming potential and low levels of hydroxyl in the Arctic, this threatens to further accelerate local warming and trigger further methane releases, in a vicious spiral of runaway global warming. For more on the threat of runaway global warming, also see the methane hydrates blog. This situation calls for an effective and comprehensive climate plan, such as described at the ClimatePlan blog. * IASI (Infrared Atmospheric Sounding Interferometer) is a hyperspectral infrared sounder residing on the European Space Agencys (ESA) MetOp series of polar orbiting satellites. M. E. Schlesinger, M. J. Ring and E. F. Cross, "A Fair Plan to Safeguard Earth’s Climate," Journal of Environmental Protection, Vol. 3 No. 6, 2012, pp. 455-461. doi: 10.4236/jep.2012.36055. The post below was written in 2011 to examine sea surface temperature anomalies and how they correlate with depth of waters. Clearly, shallow waters will warm up more quickly, while the major factors behind warming are the water flowing into the Arctic Ocean from the Atlantic and Pacific Oceans, as well as from rivers. The post has been preserved below as is for archival purposes. Below are temperature anomalies for the September 10, 2011, from the DMI Center for Ocean and Ice (arrows and location text added). Below is an animation with temperature anomalies for the period September 8, 2011, to October 7, 2011. As the animation shows, temperatures can differ significantly from day to day. As described in a previous knol, such high temperature anomalies are suggested to be caused partly by methane releases from hydrates. This is supported by the fact the the origin of the methane appears to be in the Arctic ocean. Above images may suggest that temperature anomalies do not go beyond 4°C. However, anomalies of more than 4°C are not uncommon in the Arctic Ocean, as shown on the animation below, based on data from JAXA/EORC and displaying sea surface temperature anomalies over the past few months. 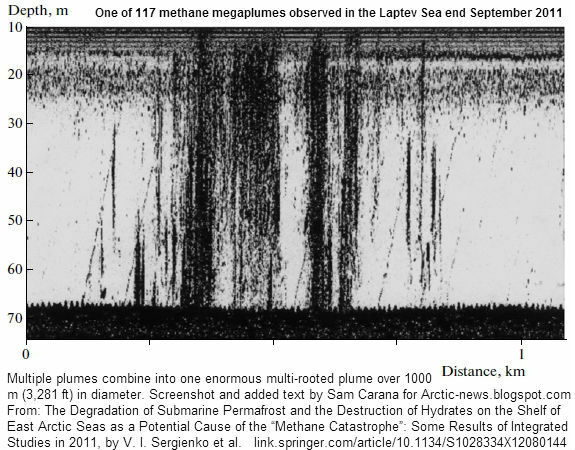 As Sam Carana suggests, such anomalies could well be caused by methane from submarine hydrates. This methane gradually moves away from the emission points with the wind, at times causing even larger temperature anomalies elsewhere, e.g. on Baffin Island, Canada, which showed an anomaly of over 12°C in November 2010. In conclusion, temperature anomalies in the Arctic can exceed 10°C and it is hard to explain such large temperature anomalies without including methane as a cause. Shallow seas warm up more rapidly than deep seas. There has been a dramatic warming of the bottom water layer over the eastern Siberian shelf coastal zone (<10 m depth), since the mid-1980s, by 2.1°C. This could possibly cause these temperature anomalies. However, as the animation below shows, there was little or no violent warming in the East Siberian Sea on this day, like in some other areas of the Arctic, despite the fact that the East Siberian Sea is rather shallow. Could methane, bubbling up from submarine hydrates, be the prime candidate to explain these Arctic temperature anomalies? Are there further candidates? This is further discussed at the pages below. The Arctic area cannot sustain these kinds of temperatures for long without doing a great deal of damage. Methane is 100 times more effective as a greenhouse gas than C02 on a ten year basis. 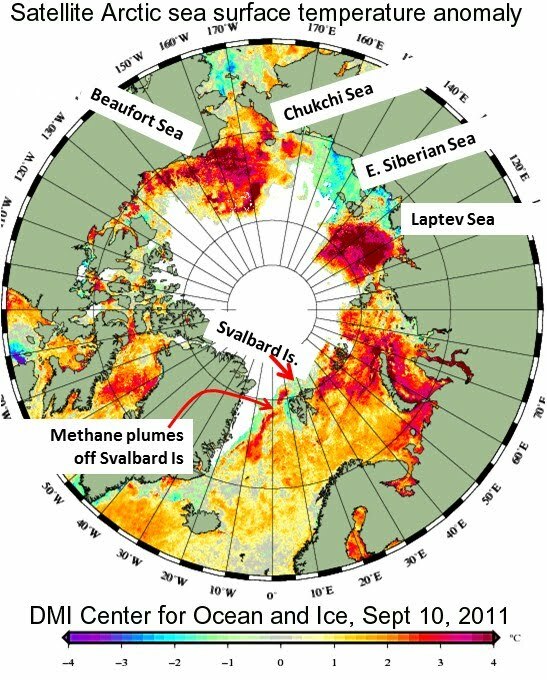 The National Atmospheric Research Group, HIPPO Project, has reported observing methane all over the surface of the Arctic Ocean. I expect the methane is coming from the methane hydrates on the ocean floor.